Hi, Good morning. Thank you friends and viewers. 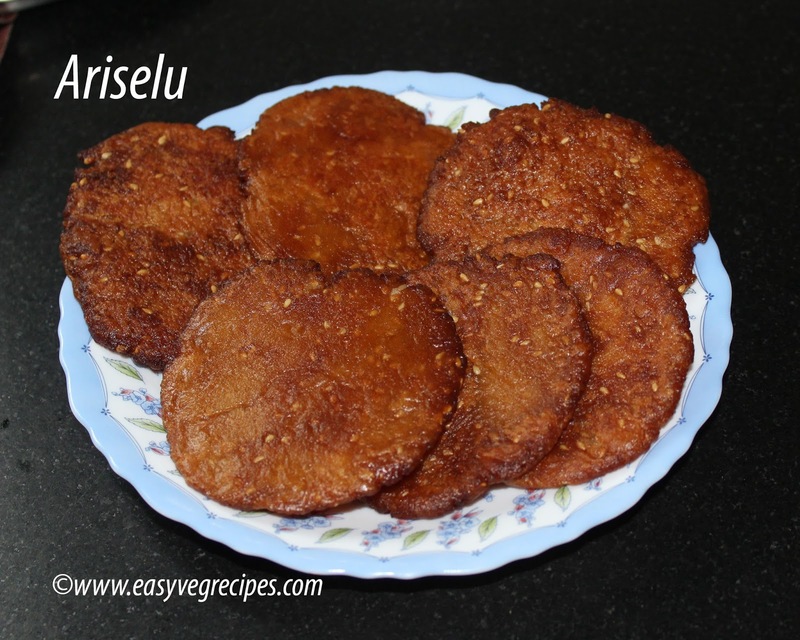 Today I will post how to make ariselu recipe. 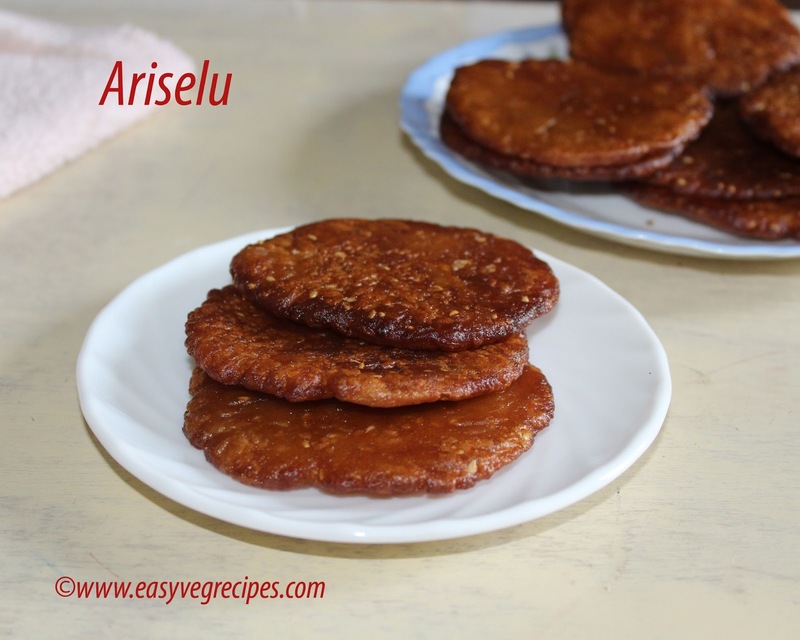 Ariselu or athirasalu are the most important festive sweet of sankranti or Pongal. If we cannot make them at least we buy them from nearby stores. This is the season we get fresh rice grains from the harvest, the first sweet people make with them is ariselu and sweet pongal or chakkara pongali as we call it. without ariselu and sweet Pongal Sankranti or Pongal is incomplete. Sweet pongal or chakkara pongali have to be made on the day of festival. Ariselu can be made before hand. There are certain important points we need to know before making them. Soak rice for at least 5 to 12 hours, it may vary depending on the quantity. Drain excess water and dry it on a cloth for half an hour, immediately grind it to a fine powder. Rice should be wet only. Normally, here in India we will have separate flour mills for grinding wet rice. Don't get confused, we can make flour with wet rice also without adding water. If we are making less quantity, we can grind it using our blender jar. But we need to sieve till we get smooth flour. This rice flour will have moisture in it. We need to keep it tightly pressed so that the moisture can be protected. We have to make ariselu immediately, once the flour dry out we cannot make ariselu. For making ariselu we have make chalividi or sweet dough with the flour. The most important task in making ariselu is making of this dough only. We have to have an instrument for making them, which is known as ariselu presser or maker. Two small flat wooden plates, one with a handle and the other one is flat. We need to place the flat one in a plate and press arise with handle one. So that excess oil can be drained completely. Of course, without this special tool also we can make ariselu, as I did. I do not have ariselu maker. So I used steel container and a small vessel. I kept steel container in the bottom and pressed arise with another vessel. I kept this entire thing in a wide vessel, so that the entire excess oil would drain into it. Wash and Soak rice for 5 to 7 hours. After 7 hours, drain out excess water and spread rice on a plain cloth. Let it dry like this for half an hour. Add it in a blender jar and grind it to make a fine powder. Keep this flour tightly in a bowl, by pressing with our hand. Heat a thick bottomed vessel, add chopped jaggery. Cook till we get right consistency syrup. To check the consistency, drop a little bit of the syrup in cold water. If it turns out to a smooth and soft ball, then the jaggery syrup reached right consistency. Switch off the flame and keep it aside. Add a spoonful of oil and sesame seeds and mix them swiftly. Keep adding rice flour to this syrup till we get a pliable dough. To check whether we got right consistency dough, make a small ball with it. If we are able to make the ball easily and without sticking to our hands, then the dough is in right consistency. Heat oil or ghee in a kadai, these are made in ghee only. Grease your hand and fingers with oil, pat a dough ball and make small patti out of it, as we do for aloo tikki. Slowly drop this patti in hot oil. Let it cook in the low flame. This will puff up like puri, slowly flip it to cook the otherside also. Cook till both sides turn into golden brown. Slowly take it out from the oil using a slotted ladle. Immediately, press it using ariselu maker or the way I did. Place a small container in reverse, put the arise on it. Press it with another container. Let this entire thing in a wide plate, so that the excess oil drains. Thank you for visiting my blog. Hope you liked all my recipes. Any feedback and comments are appreciated. For more sweets and snacks click here.